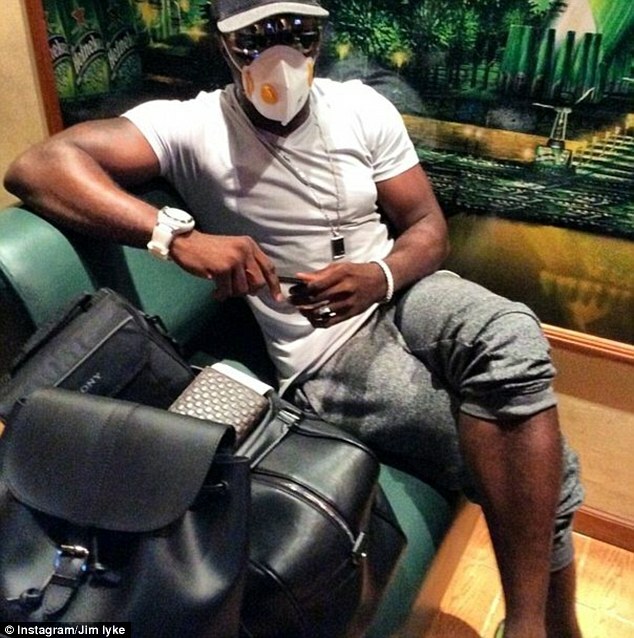 Nigerian actor, Jim Iyke has sparked outrage after posting an image of himself wearing an Ebola mask while sitting in a first class airport lounge as he flees Liberia. ‘Nollywood’ star Jim Iyke posted a message on his Instagram page saying he had cut short a business trip to Monrovia in Liberia – where at least 600 people have already died from the disease. The contrast between Iyke’s image of first class luxury is in stark contrast to the thousands of terrified Liberians who are living in fear of contracting the deadly disease. However, much of the anger about his image stemmed from fear among Nigerian citizens that Iyke appeared to be travelling back to the country without having been tested to see if he was infected. Others picked up on the fact Iyke had an expensive face mask to protect himself, but was wearing a short-sleeved T-shirt. Ebola is transmitted through close contact with the blood, secretions, organs or other bodily fluids of infected animals, and in many parts of West Africa people are being told to cover as much of their body as possible to ensure the infection doesn’t enter their bloodstream through a small cut.